Viking warriors were known for their violent acts of marauding and pillaging. But the Viking people were also explorers, traders and farmers—based in Scandinavia (Sweden, Denmark and Norway) in the 8th-11th centuries. Agriculture sustained the Viking’s existence, interspersed with occasional conquests for riches. When they weren’t farming they were raiding towns, monasteries and churches to supplement their wealth and gain land for settlement. The Vikings also exhibited exceptional skill in shipbuilding and navigation. Coastally-based locations like those in Britain became easy targets. The raiders employed quick and tactical attacks; they were in and out before any defense could be mustered. But it wasn’t all war and plunder. The Vikings embarked on journeys at sea, settling in new lands like Greenland and Normandy. They were merchants and traders. They made markets in fur, iron, amber, timber, gold, silver, silk and spices. Viking settlements were established as far away as England, Ireland, France and North America. Leif Eriksson’s Vikings even arrived in America 500 years before Columbus. Runestones are stones that have runic language, symbols and icons inscribed or chiseled into the surface. Even before the Viking Age, early Scandinavians used the stones to commemorate locations or honor the dead. The majority of existing runestones date to the age of the Vikings (793-1066 AD). While most runestones are found in Sweden, there is one outlier that has caused significant controversy among the scientific community and conspiracy theorists alike: the Kensington Runestone, discovered in a rural Minnesota farm field by Olof Ohman in 1898. The inscription on the Kensington runestone describes how Scandinavian explorers traveled west from Leif Ericksson’s Vinland settlement and were attacked (presumably by Native American indians) in 1362. As the theory goes, the expedition could have reached the prairies of Minnesota by way of the St. Lawrence Seaway, traveling through the Great Lakes to their terminus in Duluth, Minnesota. Challenges to the validity of the Kensington runestone story remain. Was it a hoax created by Swedish farmers or a real record of an exploration into the new world that predates Columbus by over one hundred years? Judge for yourself—the stone is currently located at the Runestone Museum in Alexandria, Minnesota. The Viking warriors were advanced shipbuilders, allowing them to travel greater distances and sustain longer journeys than other sea-faring cultures. Viking longships were built with advanced technology for the time; the overall length, shallow hull and many rows of oars allowed for speed and maneuverability unlike any other. The boats were fast, light and flexible in the open seas. 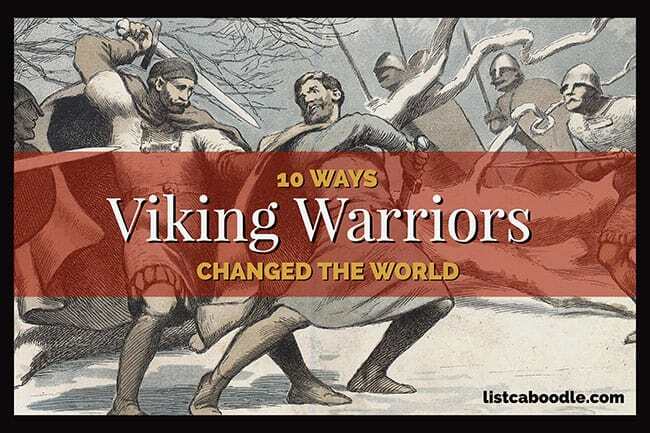 The ability of Viking explorers to navigate held great advantage over their foes. They made use of the sun compass—which used calcite crystals or sunstones to show the sun’s location—allowing the Vikings to navigate at any time of day and in any weather condition. Interestingly, the Vikings so revered their boats, they honored the dead by burying them in their ships for their journey through the afterlife. Old Norse, the language of the Vikings, gave birth to hundreds of words now used in the english language. The name Viking is from the Old Norse “vikingr”, meaning one who goes on expeditions, usually by sea. Thursday – Thor’s Day, Thor the Norse god of Thunder. 12th century Old Norse “thōrsdagr”. Modern Swede’s say Torsdag. Viking marauders made their way into eastern Ireland in 838 AD. They set up a base camp in a strategic location that eventually became the city of Dublin. More bases—or as the Irish called them, longphorts—were established in what is now the towns Wexford, Waterford, Cork and Limerick. The Vikings commanded the region by way of the River Liffey and its branches. Historians believe Vikings did not actually have horns on their helmets. Images depicted on ancient archeological artifacts and relics show conical Viking helmets without horns. And an actual Viking-age helmet found in Norway is made of iron and has no horns. Horned helmets are more likely an exaggeration by 19th century artists and painters to dramatically enhance their depictions of ferocious warriors at battle. The French region of Normandy—from Old Norse meaning “northman”—was conquered by Viking raiders beginning around 800 AD. The first ruler of Normandy was a Viking named Rollo (Gaange Rolf). It is said that he was so physically imposing that a horse could not carry him; he had to travel by foot. The Vikings settled Iceland in the late ninth century. They attempted colonization of Greenland, but abandoned it in the late 15th century. Historians theorize hunger, climate and isolation may have played a role in their leaving. The Vikings, led by Leif Ericksson, arrived on the North American continent in northern Newfoundland. He named the settlement Vinland. Close up of runestone inscription shows Viking god Ullr with archer’s bow and skis. Scandinavians were among the first humans to make use of skis 6000 years ago (archeologists have discovered even earlier skis in Russia). Skiing provided them a means for transportation in winter months, as well as recreation. Skiing became so much a part of the Scandavian culture that they gave it a name, “skio” meaning a stick of wood. The english “ski” derives from the original Old Norse word. Norse mythology even included references to skiing. The Norse god Ullr was known for his skill in archery, skiing, hunting and skating. The popular image of Viking warriors is of wild, hairy men wearing heavy iron armour and spending days at sea, marauding and killing foes. In fact, it is believed Vikings bathed about once per week. And the wild, unkempt hair? They had crude combs carved from deer antlers to keep it together on bad hair days. And the manscaping didn’t stop there. Scientists have found combs and other grooming utensils in Viking grave sites—including tweezers, ear wax spoons and razors. Speaking of hair, the myth of the blonde-haired Viking may have some truth. Blonde hair was prized in Viking times, even among men. Vikings used soap infused with lye to bleach their hair and beards. Even in the patriarchal Viking culture, women maintained powerful roles. Women could own and inherit property, divorce from their husbands and even reclaim their dowry. Strong Viking women included priestesses, oracles, poets, merchants and medicine women. Viking women may have also participated in warfare. In 1889 archaeologists discovered a Viking woman’s burial containing artifacts possibly indicating she was a revered warrior. Along side her bones were an array of weapons along with horse bones, an honor bestowed upon high-ranking warriors. NEW: Megan Fox explores Viking myths and legends in the new Travel Channel series Legends of the Lost. She discovers new evidence of Viking Women Warriors. Viking oral tradition consisted of mythological stories and fantastic poems, called sagas. These tales could be about voyages, battles, journeys, deeds and Icelandic feuds—repeatedly told over long winters. Sagas were written by Skalds, Viking poets who wrote in honor and in praise of kings and patrons, and other anonymous Old Norse sources (Eddaic) about many topics. These stories were about real characters, but were sometimes fictionalized or written with exaggeration and poetic license. The red-haired Norse explorer who founded the first settlement in Greenland. Son of Erik the Red; the first European to set foot on the North American continent in the area of northern Newfoundland. He named his settlement Vinland. Son of Erik the Red and brother of Leif Eriksson. Participated in the expedition to Vinland (North America) and was the first European to die there. Legendary Viking ruler and hero of 9th century wars with what is now France and England. Son of Ragnar Lothbrok; Famed invader of England; led the Great Heathen Army along with brothers Björn Ironside, Ubba, Hvitserk and Sigurd Snake-in-the-Eye. Son of Ragnar Lothbrok; powerful naval warrior in raids on France and the Mediterranean; King of Sweden. 10th century Norwegian and Northumbrian king; little is know about him outside of Viking sagas. The protagonist in Egil’s Saga and Viking-age poet, warrior and farmer. Wife of Eric Bloodaxe who appears in many Icelandic sagas. The first King of Norway, he reigned from 872 to 930 AD. Father of Eric Bloodaxe and Haakon the Good. Great chief of Hålogaland who participated in the killing of King Olaf II of Norway in the Battle of Stiklestad (1030 AD). Along with his wife and brother, one of the first permanent Norse settlers of Iceland, founder of Reykjavik. Olaf Tryggvason, great-grandson of Harald Fairhair, was King of Norway from 995 to 1000 AD. First ruler of Normandy, France. Legend states that he was so physically strong and imposing that he could not travel by horse, and could only walk. King of Denmark from 1047 to 1076 AD. A commander with the Great Army; invaded England in the 860s. A rare and unique Viking warrior’s sword found in southern Norway, possibly belonging to one of King Knut’s men, dating to 1030 AD.